Subterranean Jazz is a jazz group from Phoenix Arizona. They formed in 1998. Subterranean Jazz playing original, improvisational music which highlights danceable grooves from around the world while maintaining the creative edge of straight-ahead jazz. The quartet features tenor sax, guitar, bass and drums. Subterranean Jazz is an acoustic improvising band, playing original tunes that draw inspiration from many sources; straight-ahead jazz, Celtic, Caribbean, Mediterranean, Latin, North African styles and plain old indefinable rumblings from the unconscious. Subterranean Jazz features Tom Clohessy on Tenor Sax, Jimmy Peggie on Bass, Dave Sorensen on Drums and Jeff Lauffer on Guitar. Based in Phoenix Arizona they are working on creating a unique jazz sound. The group was formed in 1998 when Tom and Dave, who had been playing together for a few years and working towards something “off the beaten path”, met Jimmy, a bass player who shared common musical directions. Soon after, the trio wet their musical feet as Lyra Collective. When guitarist Chris Rogers joined the group the joyous clang of chords was heard and Lyra became Subterranean Jazz. The Subterraneans honed their sound, concentrating on originals, while gaining some steady gigs and recording their eponymous debut CD in 1999. The band received the New Times Best Local Jazz Band Award and even gained popularity on Dominican Republic radio! In 2000 Chris left to pursue other work and Jeff Lauffer joined up as the new guitarist. The group recorded their 2nd CD, Subway Sonnets, in 2001. The CD has received steady radio airplay as well as nationwide rave reviews. 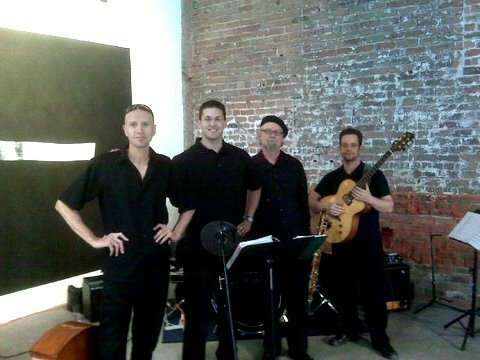 The group has played regularly around Arizona in the Phoenix area, Sedona as well as down in Tucson. Recently they appeared at an Refugee Benefit where they were joined by a Kurdish singer during an original Celtic-style dance tune! Subterranean Jazz continue to write and record new material with an emphasis on rhythmic interaction as well as the incorporation of influences from around the world. Their next CD is expected to feature some of this material while showcasing their Celtic influences. Tom Clohessy from Los Angeles plays tenor sax. He is also a guitarist who came to jazz through an interest in the British folk-jazz guitar scene of the sixties. He cites Lester Young, Pharaoh Sanders, Bert Jansch, Joao Gilberto, and traditional Irish music as major influences. Jimmy Peggie hails from Perth in Scotland where his father played Alto Sax and his uncle played Double Bass. From an early age he was obsessed with music and he was exposed to Scottish Dance Music, Big Band, Pop, Jazz and all points between. He teaches, records and performs in a variety of situations in the Phoenix area. Dave Sorensen has been playing drums since his youth in hometown Chicago. He is a graduate of the ASU music program. He studies and teaches African drumming and works in Music Therapy. He is also a musician with the Playback Improvisational Theater Group. Jeff Lauffer grew up in an Italian family in Albany NY. He is a graduate of the ASU Jazz program with 10 years of performance experience. He plays guitar in a variety of situations around the Valley. He has performed with many great musicians including John Stowell, Dom Moio, Kim Richmond, Clay Jenkins, Sam Pilafian, Chris Champion and the legendary clarinetist Bob Wilber.